Singkarak is not just beautiful but has long been famous as a symbol of Minangkabau Culture, including its local delicacy of Ikan Bilih(Mystacoleucus padangensis) that is endemic to this lake. Despite of the importance of Singkarak Lake to Minangkabau people, the impact of climate change has been perceived in this ecosystem. It affects the supply of water to the runoff and further livelihood of the surrounding community. As a response to this problem, CCROM SEAP IPB, in cooperation with Ministry of Environment and Forestry (MoEF) and United Nations Development Program conducted a kick-off meeting on the “Strengthened Communities’ Endeavors to Diversified Livelihoods to Anticipate Climate Change Risks on Singkarak Lake, West Sumatera” on Monday, 21th March 2016 in Solok, West Sumatera. This activity is one of six pilot projects that will be implemented to develop the appropriate adaptation options during the Indonesia’s Third National Communication (TNC) to the United Nations Framework Convention on Climate Change (UNFCCC). It aims to assess local climate change impact and vulnerability, as well as to strengthen the capacity of local stakeholders in conducting vulnerability and adaptation (V&A) assessment. Kick off meeting that was held on Monday (21/03) was attended by the Director General for Climate Change of MoEF - Nur Masripatin, Vice Mayor of Solok District - Yulfadri Nurdin, Director of Climate Change Adaptation of MoEF – Sri Tantri Arundhati, Executive Director of CCROM SEAP – Prof. Rizaldi Boer and 60 participants from local agency of Solok District, and Wali Nagari around Singkarak Lake. The meeting resulted in some recommendation for the future implemented program, including to support the development of ecotourism and agroforestry, and the implementation of green spatial planning in the surrounding area of Singkarak Lake. Picture (left) “Singkarak”, documentation of CCROM SEAP 2016. 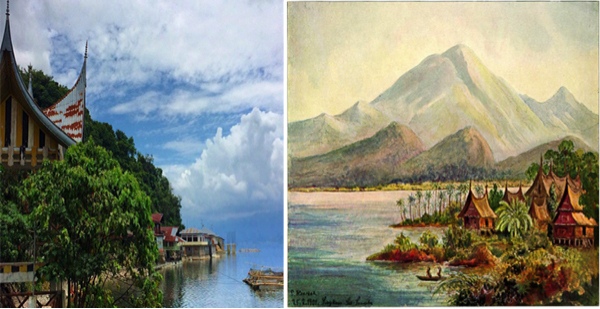 (right) “Lake Singkarak” by Ernst Haeckel's 1905 - Wanderbilder.